Now that we know CRS-17 will use a new core (1056) when should we expect it to head to McGregor? The flight is scheduled for NET April 25th as of now. So has this been confirmed? I thought CRS-17 might use DM1's 1051 core. And I thought it had been confirmed that 1051 would be S1 for the In-Flight Abort test. The article also revealed the first dedicated Starlink launch, which is scheduled for NET May. No word on which core it'll use. My guess would be 1046.4, simply because SpaceX has every incentive to use their own flights for envelope-pushing, and we know 1048.4 is earmarked for IFA, but who knows. I too was surprised to hear about CRS-17 going on a new core instead of 1051.2. 1051 seemed like the obvious choice because it would have (I'd thought) fit NASA's criteria perfectly. I wouldn't be surprised if that was indeed the original plan. But we're likely seeing the ongoing scheduling impacts of 1050 taking a bath, since 1050.2 had been slated for RADARSAT. It seems the RADARSAT people contracted for a .2 booster, and ended up sticking to that instead of relaxing their reuse standards to avoid a delay. Since SpaceX doesn't currently have any .2's in stock besides 1051, they'd either have to bump RADARSAT to a new core (assuming the contract would even allow that, although it probably would), or bump CRS-17 to a new core. Either way a new core has to enter the mix. They appear to have chosen the latter. The article did mention that "this is subject to change", so it may be a subject of ongoing negotiations. Perhaps one or both of the customers may yet be willing to relax their reuse standards and accept a booster of more advanced age. The news of STP-2 now being planned as 1052.2/1057.1/1053.2 is also quite interesting, although not surprising in retrospect. As the article notes, the center core recovery on ArabSat-6A (1055.1) is going to be quite challenging, because FH center cores reach a higher velocity than F9s and it'll be landing very far downrange. Presumably it'll have far less of a margin to scrub that extra velocity with a boostback burn than the FH-Demo mission (with its very tiny payload) did. Even if they do get it back without a problem, the odds are still distinct that it may require extra refurb time since it'll have been through a lot and they haven't had experience refurbing a center core yet. So it makes sense to build a second one to ensure STP-2 isn't delayed. Having a total of two FH center cores in permanent rotation long-term would make a lot of sense. There aren't a lot of FH flights, so they don't need a lot of them, but having at least two is wise so their whole schedule isn't at the mercy of one thing going wrong. No such problem exists with side boosters since they can be converted from F9s on (apparently) short notice, and they've got tons of those. So did most of us (including me)! Apparently 1048 (and maybe some/all of the other pre-1051 boosters) has been upgraded to COPV 2.0 standards during one of its refurbs. 1048.4 being assigned for IFA is straight from the horse's mouth (er, Elon's Twitter) so it's definitely legit news. Dang, I even read that article. Just can't keep the numbers in my skull straight! Does anyone even know of what became of Core 1050? It was recovered, towed into Port Canaveral, and taken to an undisclosed SpaceX facility at CCAFS. No additional info has been provided (else it would be here or at least in L2). I was expecting core 1051 to been seen traveling West by now. It is supposed to launch RadarSat mission next month.. In the video in the following tweet, there is a sooty booster to the West (right) side of LC-39A hangar. I assume that is B1048, waiting for the in-flight abort test in June. You can see people working on that core, even rotating it. On the East (left) side, there seems to be an incomplete, wrapped-up booster. In the video in the following tweet, there is a sooty booster to the West (right) side of LC-39A hangar. I assume that is B1048, waiting for the in-flight abort test in June. It may be 1046 for Starlink, since it is early May. B1048 or B1046 would look A LOT sootier, both have completed 3 flights. That one seems to have been used once which would make it B1051 being refurbished for RADARSAT. Good point! So they are getting it ready for the trip. Presumably we will see it soon. Most seem to think it is 1056 although 1046 is a good possibility. The main argument against 1056 is that it should already be at LC40, is there any indication this is true? Given that Starlink-1 is scheduled for some time in May, it does seem like 1046 should be heading East around now. If it's the one just seen at the state line it'd be right on schedule for a mid/late-May launch. If we see another booster heading to the Cape within the next week or so, it's almost certain that one of them will have been 1046 and the other 1056. Either we'll see that soon, or we missed one of them, or CRS-16 has been delayed substantially. "We" seem to be doing a good job not missing any lately (the last time we thought we missed some, we incorrectly assumed that 1052 and 1053 were F9 boosters being stockpiled at MacGregor; we later learned we hadn't, in fact, missed anything and SpaceX took their time making the FH cores), so I'm hesitant to conclude that. In particular, the Florida/Alabama weigh station is a known bottleneck that quite a few folks have the opportunity to consistently watch these days. It'd take some doing to escape all those watchful eyes. I'd be really surprised if they use any booster other than 1046(.4) for Starlink-1. It's the obvious choice given that it's difficult (and perhaps costly, in terms of extra discounts or other motivating concessions) to find customers willing to "push the envelope" with reflight beyond what's been demonstrated before. It's true that this first Starlink flight is extremely important for their future business plans (the FCC deadlines make it crucial that they get the constellation up on schedule), so on that token, they shouldn't be any more willing to take any unnecessary risks with this flight than their average comsat customer would. However, demonstrating the safety of reuse is also critical to their future plans, so they likewise can't afford to certify a booster for reflight at all unless they're confident it will be safe and reliable. (A RUD on a reflight, even if it's "just" one of their own Starlink flights, would be devastating to customer confidence in reuse. Not to mention that it would ground the fleet for likely months during an investigation, something they can't really afford.) Thus, with only themselves to convince, they should be quite willing to "push the envelope" by flying Starlink-1 on the inaugural .4 flight. Not flying Starlink-1 on 1046.4 would be a telling tacit admission of unconfidence in their ability to push to a fourth flight. It would indicate that either a) they don't trust 1046 to fly a fourth time, or b) they haven't had sufficient time to inspect and refurbish it and are concerned about schedule risk for the (rather time-critical) Starlink-1 mission. Either case would not look great for them, and would run counter to the impression we've been given publicly, which is that the boosters are largely in great shape and that they're getting better and better at turning them around quickly. 1046 last flew in December, so by mid-May they'll have had 6 months to inspect and refurbish, which should, at this point, be plenty even if they had to replace a lot of key parts. 1056.2 for CRS-18 is also an educated guess but, I think, a very likely one. NASA seems to still be keen on sticking to "its own" (or at least, the government's) previously-flown boosters which have only flown one gentle mission. The fact that they are ordering a new booster (1056.1) for CRS-17 is evidence of this - otherwise the logical move would be to grab 1049, which clearly isn't needed anywhere else in the near future (barring unannounced flights). 1056.2 would be within the established norms for CRS reflight acceptability. If they can avoid using 1056 for any non-NASA flights after CRS-18, I think it is quite likely we'll see CRS-19 flying on 1056.3. It's high time NASA took that next step to .3 and a "CRS-only" booster would be the most attractive option for doing so. 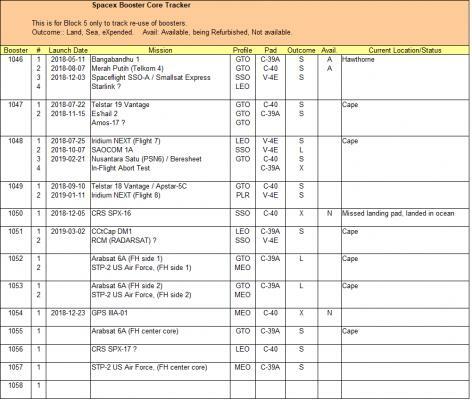 Could we maybe keep the reuse speculation in the "SpaceX Core Reuse Schedule" thread at https://forum.nasaspaceflight.com/index.php?topic=45247.0, and keep this thread dedicated to actual core sightings?